NOTE: My daughter, Jessica, was a student in Flensburg, and she sent in her favorite route in that beautiful old Baltic bi-lingual harbor town on the Danish border. It's one of the few runs where you can run over an open border, where people speak 2 languages. Flensburg is the northernmost city in Germany. It lies on the Flensburg Förde, which is a long fjord that eventually leads to the Baltic sea. This run takes you along the Förde, right across the border to Denmark without you even having to take your passport. The route starts north of the town centre. You can get there on the No.1 bus towards Krusau/DK from the centre in about 10 minutes. Get off at the stop called Ostseebad, and head east towards the water. There are several walking paths leading down to the beach. 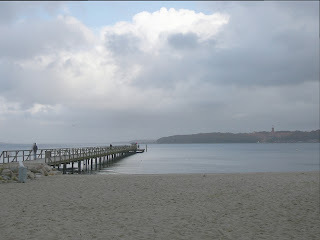 From here, there is a beautiful walkway going along the water towards the next beach, Wassersleben. Next to this walkway is a small woods, through which you can also run a little loop. 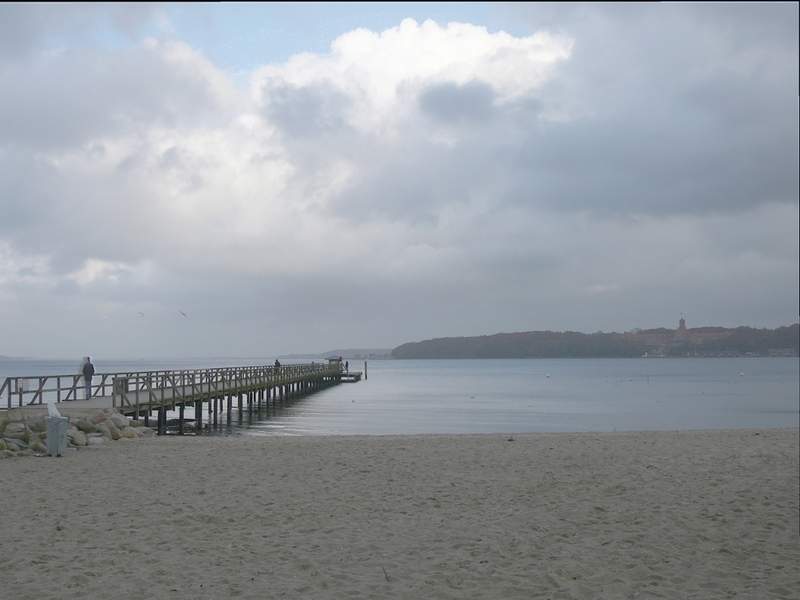 At Wassersleben, there is a paved pedestrian way going all along the beach. When you get to the end, there is a small street branching off to the right. Before you know it, you've crossed the border to Denmark - there isn't even a sign indicating it. This street now keeps you jogging along the Förde and it soon turns into a wide, unpaved walking- and cycling path. Again, there’s water to your right and woods to your left. You can stay on this path for quite a while, and I normally turn around at some point. If you keep jogging, you'll come past some cute Danish villages, which might be worth the effort. When you head back to Wassersleben, and the weather is nice enough, the best refreshment is taking a swim in the Förde before you jump back on the bus. There is a bus stop right at the beach, but you can also keep running a bit further north, to Kupfermühle (copper mill). This is a cute little town that was founded in the 17th century, when the Danish king built a hammer-mill there. The old workhouses are still there today and there is even a copper mill museum. In Kupfermühle you can catch a bus back to the center of Flensburg.